I use the Path Tool for arrows, is there a script for “Lines” I can down load? As long as you pick a brush with a soft edge (11 x 11) & turn on antialiasing it doesn't look too bad. Go to "Edit > Preferences"
Find & click the "create reg polygon" looks like |><> next to the star. You could draw your stem first, then draw the triangle part on top. -Click the [_] icon on the gfig toolbar "create rectangle"
I have this one. Start with selecting Paths tools. Click plugin. Select 2 anchor points. Easy. ➜➜You can slide one of the anchors to change the direction or length of the arrow. (Feb 6, 2014 00:39)ofnuts Wrote: What do you mean by "script for “Lines”". I use the path tools to draw arrows, it required the arrow.scm " It was my understanding that is a script. I want to use the path tool to draw a straight line. 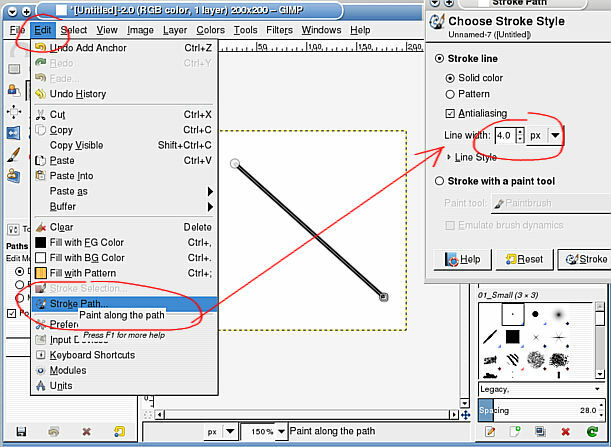 (Feb 6, 2014 16:28)2Old Wrote: I want to use the path tool to draw a straight line. Edit menu -> Stroke path. That brings up a dialog where you can set the line width or other options. It uses the foreground colour, so set this first. Ok, thanks that works. LOL I just need to work with it a bit. Thanks, don't need an arrow. The script "arrow.scm"I have for that works great. I needed just a line.